Andrew was appointed inaugural Dean of the College of Law and Justice in 2012, a position he held until December 2016. Prior to this Andrew was Head and Dean of Victoria Law School for five years. 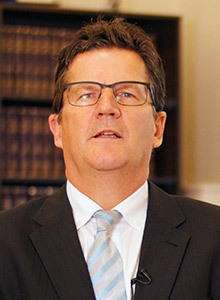 Until the completion of his term in December 2016, Andrew was the longest current serving Dean in Victoria. Andrew also has extensive teaching and research experience. He has a doctoral degree from Bond in Comparative Corporate Governance under the supervision of Professor John Farrar. Andrew has taught in the areas of corporate law, torts, corporate governance, negligence law and commercial law. He has also presented extensively at seminars in these areas and in legal risk management. Andrew's research is in the areas of management and leadership, corporate governance, comparative corporate governance and corporate law. His interests include legal risk management (and its intersection with negligence law), business law and management. Andrew has experience of research supervision to doctoral level, in the areas of corporate governance, comparative corporate governance and corporate law. Andrew has completed an ARC Linkage grant with Federal Treasury being the lead industry partner. Andrew has worked internationally (7 years in the UK) and published two books in the UK on corporate governance and business entities, and a further three in Australia. His book on Tort law: a practical learning approach won a national publishing award in 2004.